Breakfast is the most important meal of the day, isn’t it? You must’ve come across the phrase have that one should have breakfast like a king, lunch like a prince, and dinner like a pauper in order to remain in the pink of their health. But, how often have you ended up following this maxim? Twice, or thrice? Most of us end up paying very little attention to this most important meal of the day. In our rush to reach the office, or school or college, we often end up gulping a glass of milk or a half-baked toast in the name of breakfast. If you follow such a routine and are wondering how come you’re still gaining weight despite eating so little, then we would like to tell you that it’s your breakfast routine which is the culprit here. 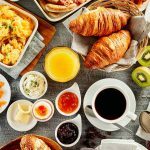 To warn you again, such breakfast mistakes that are making you pile on the extra kgs, we have collated a list of common breakfast mistakes that make you gain weight. Give it a read and save yourself from spending that torturous extra hour in the gym. Having karele ka juice (Bitter gourd juice) for breakfast might seem like a very healthy alternative, but we are here to tell you it’s not. Even if you are drinking juice which has been made in the healthy, hygienic environment of your home, you are still missing out on a very important component of a healthy breakfast – fiber. When you consume vegetables, and fruits in the juice-form you miss out on their fiber content, and it is the fiber content that makes you feel full for longer durations. So, if you want to avoid mid-day snack cravings, go for the fruit instead of opting for fruit juice. It’s true that one should eat breakfast like king, but you shouldn’t apply that maxim to mean that you should only gorge on indulgent delicacies for breakfast. Instead of having aloo-parantha in breakfast, have hard-boiled eggs. Having a protein-rich meal in breakfast will make you feel full for longer durations and thereby, help you avoid overeating. Plus, it will also make you feel more energetic the entire day. If you’re someone who loves to whip up a quick breakfast by making pancakes by using the ready mix or often goes for options such as muffins, then you are only adding to your weight worries. This is because, such foods have very less fiber, but they have a lot of carb content. We aren’t saying all carbs are bad, instead of having these options in breakfast you can go for other options which have complex carbohydrates. Your body takes quite a bit of time to digest those, and therefore, you won’t experience those mid-day hunger pangs and thus, will be able to avoid snacking. When it comes to your meals, when you have them is as important as what you have in them. Ideally, one should have breakfast within two hours of them getting up. In fact, it is better for your metabolism that you do so (1). Postponing your breakfast to a later time often leads one to overeat when they finally break their fast, and therefore, this is one breakfast mistake that you should steer away from. A bowl of cereal definitely does look like a promising nutritious meal. But, it packs in quite a punch sugar-wise, but not so much in terms of the claimed nutrition. If you include such foods in your breakfast, you are actually stocking up on more calories than what you bargained for. So no matter what that pack of juice or cereal states, if healthy food is what you’re seeking, switch to having something like an avocado toast. We all have those days when our schedule is such that having breakfast seems like a luxury that we can’t afford. So in order to fit into our tight schedule, we often end up skipping breakfast in favor of an early lunch. But what we don’t realize is that doing so not only makes us lethargic, but it also hampers our metabolism. This can be very harmful if you’re looking to lose a couple of pounds. The other most common mistake is when we hurriedly grab a sandwich or a cup of coffee and have it in place of a proper breakfast. It might save you a couple of minutes, but you are bound to feel hungry sooner, and binge later on when you do end up eating something. By now, you must’ve realized that what you have for breakfast, and even when you have your breakfast can affect your weight-loss to a great extent. So, to stay slim and trim, have a hearty and healthy breakfast. Do you know of any other breakfast mistakes that contribute to weight gain? Please share them with us in the comments.